Just How Popular is Chrome/ium on Linux? Answer: Very - OMG! Ubuntu! 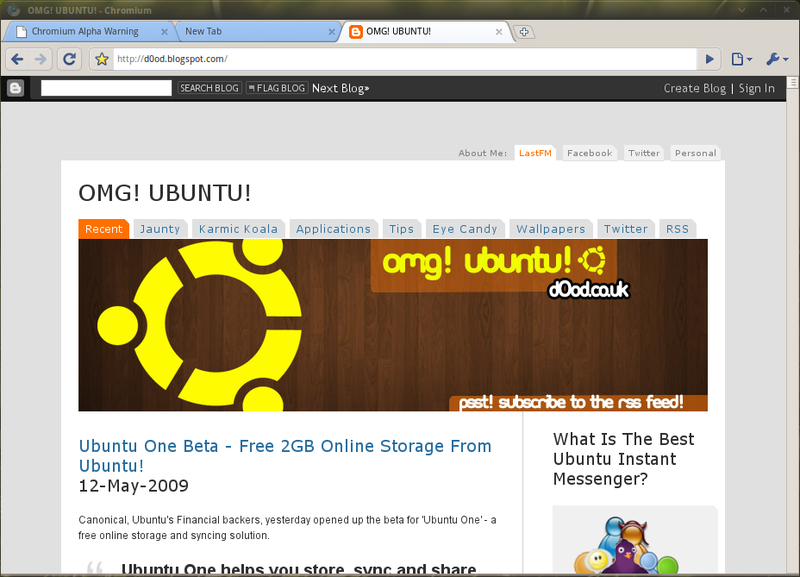 Google Chrome for Linux will be one year old on Friday 4th June. Crazy non? To mark this relatively minor milestone I’ve decided to take a look at how Google Chrome’s growth on Linux has, well, grown in that time. I can only base my findings on my blog as a whole with some outside context provided by net statistic providers. Chrome’s current worldwide usage across all major operating systems is, as of April 2010, residing at a healthy 6.73%. This position makes it the third most popular browser behind Firefox & Internet Explorer. But what about on Linux? Chromium, the open-source version of Google Chrome which implements the same feature set as Chrome, but reneges on the built-in updater and Google branding, was available several months before an official Google-endorsed version. These early builds were very basic – at first lacking even tabs and the start-page! The development, like Chrome itself, sped along at remarkable pace and the first pre-alpha release of Google Chrome proper was made available on the 4th June 2009. Development on the official Chrome was, again, extremely rapid and official betas for Mac OS X and Linux were released on 8 December 2009, with the Linux feature set almost comparable to that of Chrome for Windows, lacking only bookmark sync. To judge how popular Google Chrome is on Linux I’m going to look at visits to OMG! Ubuntu! over three separate months: the month of the first pre-release back in June 2009, again 6-ish months later in January 2010 and then in April this year. The results below show the top 3 rated browser for Linux users visiting OMG! Ubuntu! plus Midori’s share just for kicks, though note that Midori users often identify their browser as Safari in order to get it working with GMail thus Midori results are Midori + Safari/Linux combined. 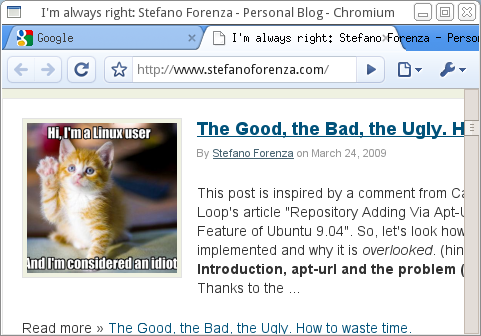 It should also be noted that Chromium and Chrome do not display independently but as one browser ‘Chrome’. % of visits made using referenced browser on Linux. As you can see Chrome has grown massively in almost one year, largely at the expense of Firefox which has seen its share tumble from a mighty 86.90% to 55.52% in just under a year. My disclaimer still rings true: These stats only represent Linux-based visitors to OMG! Ubuntu! and certainly are not flawless. Chromium, for example, is not counted as separate from Google Chrome in analytics. They do, nonetheless, give an insight into the meteoric rise of Chrome/ium and the seemingly dramatic fall of Firefox. With Chromium set to be the default browser in Ubuntu 10.10 Netbook Edition, and potentially the default browser in Ubuntu 11.04 Desktop, Chrome’s market share on Linux can only rise.